For many years I have joined the thousands of cooks up and down the country in the search for the holy grail of a Sunday roast: the perfect pork crackling. When raising this topic of conversation at a dinner table, you know that everyone's going to have their own way of doing it - favourite techniques include salting overnight, different methods of scoring the skin, blow-drying the skin before cooking, separating it off and grilling at the end, putting it between two baking trays... and trust, me I've tried them all. 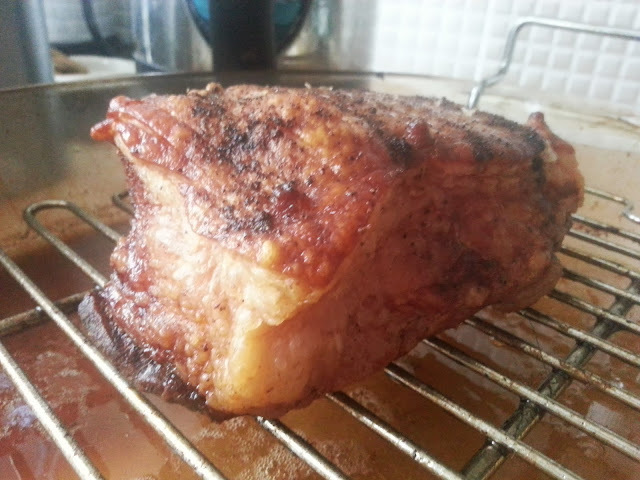 I've had varied results - some burnt-to-a-crisp, some still-a-bit-soggy, some is-this-crackling-or-a-caramelised-bit-of-volcanic-rock, but our recent trip to a rare breed piggy farm near us - Wildcroft Rare Breeds - and the resulting pork belly roast confirmed to me exactly why we can never seem to get it quite right. EAT ME. JUST EAT ME. So, here's a little recipe for the best pork belly I've ever managed to cook - and we can't WAIT to go on one of Wildcroft's looking-after-piggy courses. Take one piece of really really good pork belly from a rare breed or organic farm, remove any packaging, and generously sprinkle with sea salt so that it is scattered over the top of the skin. This draws any extra moisture out of the skin, which enables it to 'crackle'. Leave for a couple of hours at room temperature before brushing off the skin with some kitchen towel to get rid of excess salt and water. Generously season the whole thing and brush the bottom with a little olive oil to stop it sticking to the roasting rack. I like to cook my pork on a roasting rack above an inch of water on a low heat, because I find that this helps the meat to steam-cook whilst allowing the crackling to develop, and keeps it really lovely and juicy. This small-ish piece of belly (it fed two hungry people and a small giraffe) took an hour and a half on 150 degrees, plus 15 minutes on top whack at the very end to make the crackling extra... well, crackling. I served mine with roasty spuds, green beans sauteed in butter with leeks and wilted baby gems, and homemade tomato salsa. This was pigging funny. It really made me laugh, especially the volcanic rock bit.